In Offset by Vivid Green, Rebecca Loweth has responded to local anecdotes about the history of Myndd Pencarreg where she lives in Wales. Loweth explores the slippage between fact and fiction inherent in the re-telling of local histories and considers how the landscape is romanticised by these stories. She focuses in particular on stories she has heard in connection with the impact on the landscape of the area following the First World War. 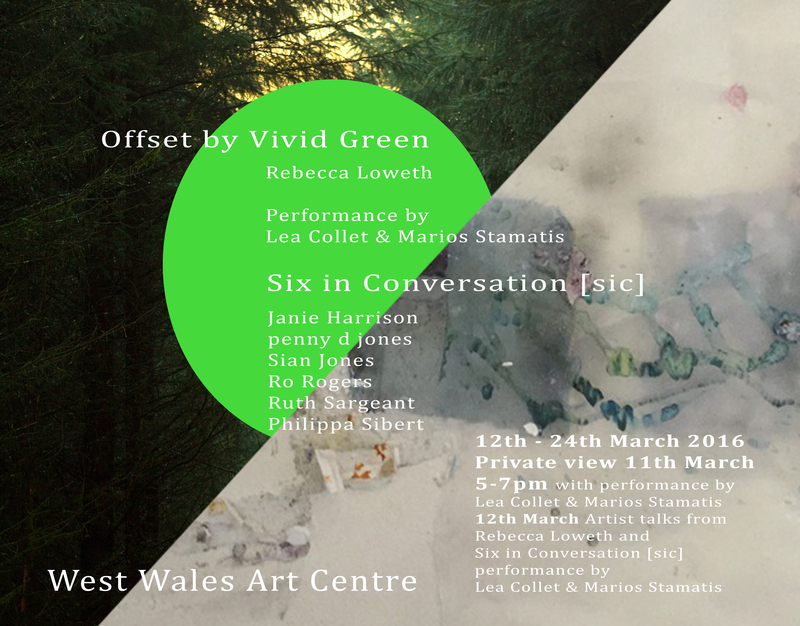 Lea Collet & Marios Stamatis will be responding to Loweth’s film Offset by Vivid Green, through a performance that they will stage over the opening weekend of the exhibition. SIX IN CONVERSATION [sic] came together around the time of the previous Women’s Day exhibition at Peppers. Taking part as individuals in a mixed show on that occasion, they are back to mark Women’s day in 2016, with their first exhibition together. With a common language rooted in Abstraction, this conversation reflects differing perspectives and an exploration of ways of working apart from the more traditional modes of expression. It is a conversation that considers how each fits within contemporary art dialogue and is a catalyst for change and opportunity. As a forum for supporting each other as women, and providing the encouragement to focus on their professional lives, this conversation is fundamentally reflective of the ethos of International Women’s Day.